By Daniel Horowitz--On April 15th, 476 passengers, mostly wide-eyed and enthusiastic teenage high school students, boarded the MV Sewol in Incheon, South Korea, for what was a highly anticipated, end-of-the-year celebratory class excursion. Less than 12 hours later, what was supposed to have been a dream day for the youngsters turned into a nightmare of unprecedented scope, as the ferry capsized off the southwestern island of Jindo, sending more than 300 teenagers to their deaths. In the wake of the tragic news, IsraAID, a partner organization of UJA Federation of Greater Toronto, did what they do best; they came up with a strategic plan to assist the affected community and immediately sent a team of professionals to help on the ground and to “train the trainers”. 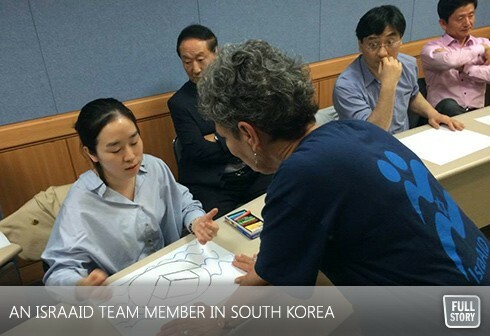 During the past few weeks, members of IsraAID have been conducting intensive trauma care seminars to over 230 Korean social workers, community counselors, psychologists and psychiatrists who are a part of the national and regional government task force which addresses the emotional needs of the community in both the disaster area in Jindo Island and the community in Ansan city. Looking to the future, IsraAID is also developing an intervention work plan for the next two years so to properly provide professionalized tools to our government and non government partners. The trickle affect would initially focus on the families but would expand to help the community surrounding the families and eventually would reach tens of thousands of people across Korea through IsraAID's TOT (Training of Trainers’ model).